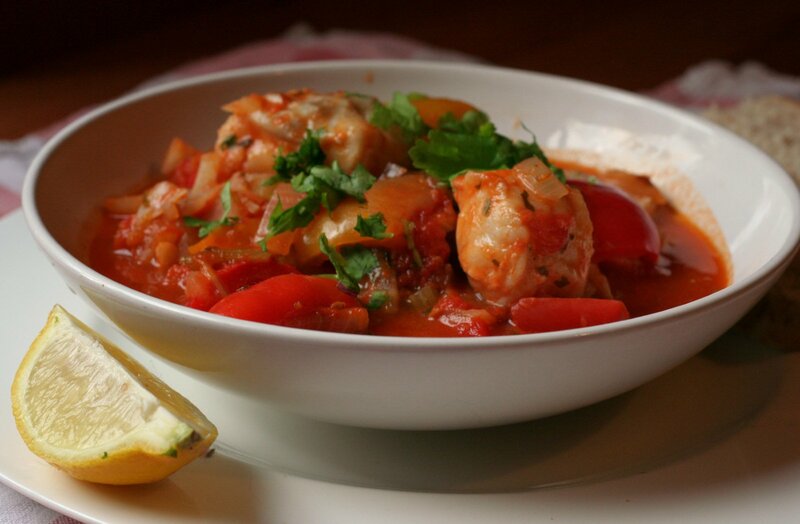 White fish is one of the best ways to eat protein, and actually one of the most convenient things to cook for a quick healthy dinner as you can buy really cheap white fish frozen and cook it straight from the freezer in this spicy mediterranean stew. Coley is a great option and don’t be put off by the packs where the fish is frozen into rectangles, these really are cheap and perfect for this type of dish as it all gets flaked up. This dish uses grated courgette, which is a clever way to bulk out tomato sauces without adding loads of extra calories and you dont get soggy bits of courgette this way either. Fry off your onion with pinch of seasoning until softened, then add your chopped pepper for a few more minutes. Once the pepper has started to soften too, add the grated courgette, tomatoes, tabasco and chilli. If you have a lot of stalks on your parsley, chop these finely and put them in the sauce too. Bring the sauce up to a simmer, and put your fish in straight from the freezer. Cover with a lid and cook for 10-15 minutes on a gentle simmer. Check that the fish is cooked, it will flake easily if it is. Break it up into the sauce and serve in a bowl topped with fresh parsley. If you wanted you could serve this with some brown rice or pasta too.